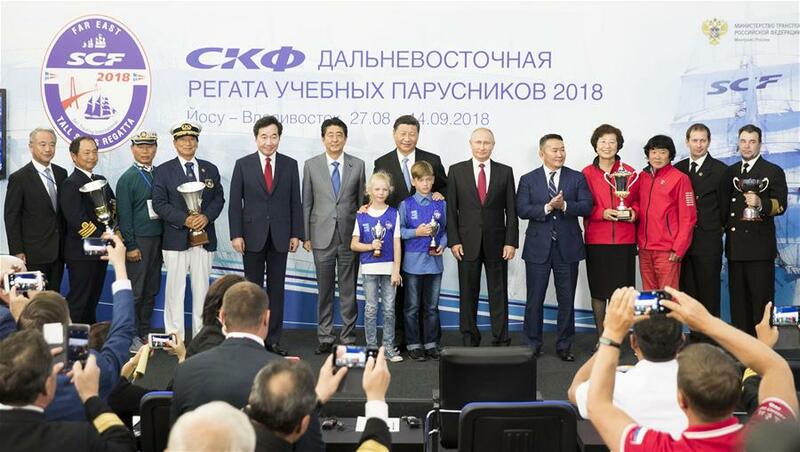 VLADIVOSTOK, Russia, Sept. 13 (Xinhua) -- Chinese President Xi Jinping's just-concluded trip to this Russian Far East city was of far-reaching significance as it cemented mutual trust and friendship and promoted win-win regional cooperation, said Chinese State Councilor and Foreign Minister Wang Yi on Wednesday. During his tightly scheduled 30-hour stay in Vladivostok, the Chinese president attended the fourth Eastern Economic Forum (EEF), held talks with Russian President Vladimir Putin, and met with leaders of other countries in the region, among other activities. The visit has infused new dynamism into China-Russia ties, opened new prospects for regional cooperation, and brought new vitality to international relations, Wang said. The strategic guidance by and close contact between the heads of state of China and Russia serve as powerful engines for the development of bilateral relations, Wang said. Noting that this was Xi's seventh visit to Russia as president and first attendance at the EEF, Wang said the trip carried on the tradition that China and Russia support each other in holding major events. Xi and Putin had their third meeting in four months, charting the future course of the China-Russia comprehensive strategic partnership of coordination and exchanging views on major international and regional issues, Wang said. That has highlighted the height and uniqueness of the China-Russia relationship, he added. The two sides agreed to tighten strategic coordination, firmly support each other, and safeguard their own interests as well as the common interests of the international community, he said. The close relationship between China and Russia, Wang said, is playing an increasingly important role in maintaining strategic stability in the world and has set a good example for major-countries relations and neighborhood interaction. Xi and Putin, in a show of the great importance they attach to the traditional friendship between the two peoples, made time to attend bilateral people-to-people exchange activities, Wang said. The two leaders met representatives of the Chinese and Russian youngsters who forged a deep friendship 10 years ago when more than 900 Chinese children from the affected areas in the 2008 Wenchuan earthquake in southwestern China went to All-Russian Children's Center "Ocean" in Vladivostok to recuperate. Xi thanked the Russian staff at the center for helping Chinese children recuperate and encouraged the young people of the two countries to serve as the pillars of their countries and envoys of bilateral friendship and carry forward China-Russia friendship from generation to generation. Xi invited the teachers and students of the "Ocean" center to visit China to write a new chapter in bilateral friendship, Wang said. Xi also called for joint efforts to push forward local-level exchanges between the two countries and deepen the understanding of each other's culture and traditions. As each other's largest neighbor, China and Russia have strong internal impetus for cooperation in various fields, Wang said. During Xi's visit, Xi and Putin charted the course for bilateral pragmatic cooperation in the next phase -- strengthening the synergy of the Belt and Road Initiative and the Eurasian Economic Union, expanding cooperation in such fields as energy, agriculture, scientific and technological innovation and finance, promoting the steady implementation of major projects, and boosting joint research and development of cutting-edge science and technology. The two leaders also made concrete efforts to promote bilateral sub-national cooperation. They attended a roundtable meeting on regional cooperation and visited "The Far East Street" exhibition showcasing the rich local cultural exchanges between the two countries and investment opportunities in Russia's Far East regions. Both countries should take advantage of the Year of China-Russia Local Cooperation and Exchange program to strengthen planning and coordination, innovate thoughts on cooperation, and tap into their complimentary advantages, so as to usher in a new era of bilateral sub-national cooperation, Xi stressed. Xi's visit, Wang said, has vigorously expanded the landscape of China-Russia sub-national cooperation and further deepened the integration of the two countries' interests. The EEF offers an important platform for international cooperation in the Russian Far East and a significant opportunity for Northeast Asian nations to pool wisdom and pursue cooperation, Wang said. Xi proposed that countries in Northeast Asia should build up mutual trust to safeguard regional peace and tranquility, deepen cooperation to achieve mutually beneficial outcomes, learn from each other to consolidate their traditional friendship, and take a long-term perspective to realize integrated and coordinated development. As a key member in Northeast Asia, China has presented a responsible and constructive image of a major country to the rest of the world by consistently participating in regional cooperation, promoting communication and dialogue among nations in the region, and creating a harmonious and friendly environment, Wang said. Xi's Vladivostok trip is pragmatic and efficient, and conducive to promoting benign interactions between major countries, he said, adding that it was also an important move in the building of a community with a shared future for mankind.